Achilles is currently trying to obtain his BH in June. Once complete, he will move onto train for his Schutzhund 1. He is an amazing dog, with a heart like no other and i am truly blessed to have him in my life. 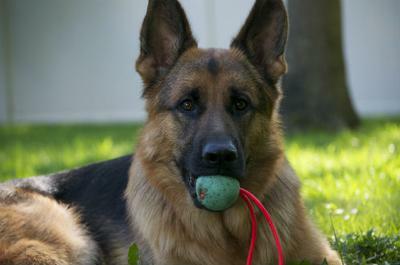 Thanks so much for sending in the story of your handsome GSD Achilles. I love the name BTW!! He is such a handsome young man. That is a really great picture of him!! He looks to be a ball hound too just like my boy Rodie!! There is nothing more handsome (is that a real word?) than a great big male German Shepherd and you boy is stunning. I wish you nothing but wonderful luck with your handsome boy. If you want to in the future maybe you can send us some updates and new pictures too. how nice. how did u get started. i have my first pup and would like to go that route also but i live in a rural area of northern california and cannot find any training centers. did u train on your own or did you join a club? Your boy Achilles is so Handsome!!! You are both Lucky to have each other! Take care of your boy and he will always take care of you!